Quality fabric of airjet looms are offered in Plain, Voil, Cambric, 2/1 twill, 2/2 twill, 3/1 drill, 4/1 Sateen, reverse sateen, sateen stripes, dobby designs, pick & pick, stretch with lycra. In count 20s to 80s in Cotton, Cotton stretch, Cotton filament, Cotton with blends, Cotton with Dyed filament, pick & pick, filafil in cotton, Viscose, modal & blends. 100% Linen fabrics from 25 to 100 lea from our Sulzer looms. 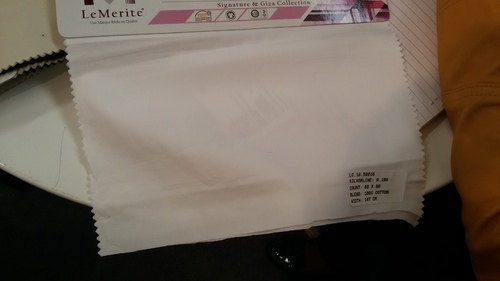 Set up in the year 2003 at Mumbai, we, Le Merite Exports (P) Ltd., are a widely popular firm engaged in the Manufacturing, Trading, Supplying and Exporting of Textile Yarns. We have been founded on four strong pillars namely: excellent quality, strong market reputation, outstanding service and sincere cooperation. Strict adherence to these core principles has helped us forge trustworthy alliances with our clients. We hold a very large share in the textile market and our textile raw materials are exported to several countries across the globe. Over the years, we have built a strong and immaculate reputation in the raw cotton and yarn business. Our sales in the year 2008-09 exceeded the 500 Million INR mark, which is an extremely laudable feat. Our main objective has always been to provide our clients with high quality products with an assured guarantee for each and every shipment. Our key focus areas are quality, excellent packaging and reliable shipment.